After three days of binge-watching the third season of Netflix’s Daredevil, one thing was apparent. I have to review this show. I wanted to talk to our readers about the beautiful cinematography that the show has painstakingly crafted, I wanted to talk about how unbelievable it was that we have a superhero show that integrates the themes of abandonment, perseverance, and faith into its narrative to a masterful degree, I wanted to share how surreal it was as a comic book fan that we have a superhero show that’s better constructed than 90% of superhero movies in cinema today. But I didn’t. Why? Because after four short years, Daredevil has been cancelled. 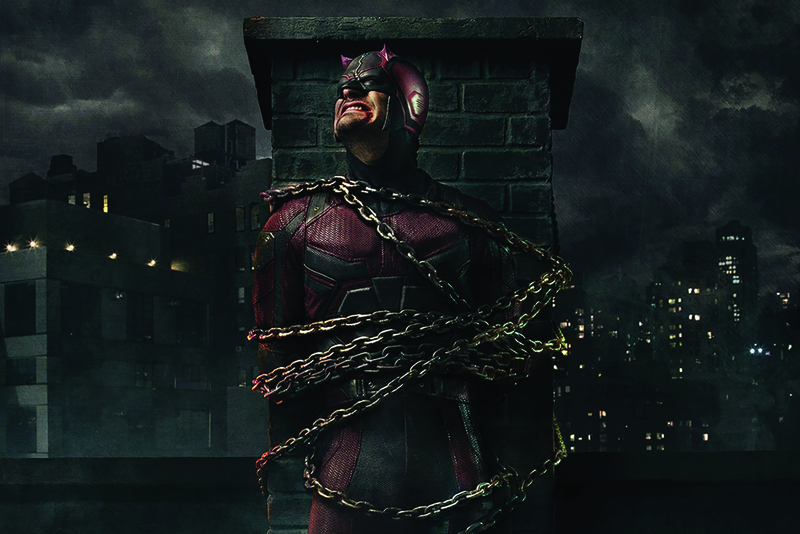 Daredevil, which launched the Marvel Cinematic Universe (MCU) on Netflix, has been canceled after three seasons. In 2013, Disney (Marvel’s parent company) and Netflix announced a deal that will bring five new Marvel series on the streaming service platform, which include the likes of Daredevil, Jessica Jones, Luke Cage, Iron Fist, as well as a limited series that will allow all of the aforementioned titular characters to crossover in a shared narrative, The Defenders. All of the Marvel licensed Netflix shows were planned to be set in the same continuity as the Marvel Cinematic Universe (MCU), with The Defenders set to be The Avengers in the Netflix corner of the shared universe. The deal would allow an unprecedented degree of storytelling, world building, character development, and coordination that would put the projects on a scale like nothing that came before. Netflix was more than happy to get a piece of the MCU empire, while Disney benefits by linking the streaming service platform’s ever expanding subscriber base to its superhero franchises and boost its theatrical profits. To many, the deal was a no-brainer as Netflix was already on good terms with the mouse house. In 2012, Netflix announced a licensing agreement with Disney that will make them the exclusive US subscription service for first-run films by Disney (which include films produced by Walt Disney Animation Studios, Marvel Studios, and Pixar). As a result of the distribution deal, Netflix gained access to a library of Disney’s most prominent and critically acclaimed content. Couple that with the 2013 Marvel deal, many expected the relationship between the corporate giants to last for many years to come. Or so they thought. In August 2017, Disney announced that they are no longer interested in continuing their distribution partnership with Netflix. Instead, they are focusing the bulk of their efforts moving forward with its own streaming service platform, Disney +. Netflix, which was the exclusive subscription streaming home to all new Disney movies, has now been partly replaced by Disney’s own aspirations. Disney went from being a partner to a competitor at the blink of an eye. While the cancellation of the distribution deal does not affect the existing Marvel shows on Netflix (since they were produced by Netflix), it certainly discourages the streaming service to keep producing them. Why would Netflix promote content that would be beneficial to their competitor? And sure enough, all of the Marvel licensed Netflix shows were axed in a little over a year after the announcement of Disney +. With companies like Universal, Warner Bros. and Disney each developing their own streaming services, it’s only a matter of time before fan favourite content such as The Office, Friends, and The Avengers vanishes from Netflix. The cancellation of Daredevil is also reflective of Netflix’s current priority towards focusing on quantity rather than quality when it comes to its in-housed productions. When it comes to pure quality of its original productions, Netflix has always been leaning towards the rear end of the pack (as opposed to companies like HBO or FX). Essentially a power move, the streaming service giant wanted the world to know that the platform isn’t indebted to any third-party licensed content. With many more streaming services set to flood the market (Universal, Warner Bros. and Disney are each developing their own streaming services, which will result lead to critically acclaimed hits like The Office, Friends, and The Avengers to disappear from the service), Netflix needed the numbers. In 2018 alone, there were over 700 different original films and series available on its streaming service platform. Don’t get me wrong though, that’s not to say that Netflix isn’t capable of producing content that are of quality. In addition to the Oscar-winning Roma and Icarus, they’ve also released Alex Garland’s Annihilation, a film that I thoroughly enjoyed. But for every Daredevil and Stranger Things, there seemed to be dozens of originals with the quality more akin to the likes of Death Note or Sierra Burgess is a Loser flooding the streaming platform. What started out as a stage that could house some of the most experimental and revolutionary projects has morphed into a platform that isn’t shy to entice its audience with cinematic comfort food of the sparkling and most basic of sorts. Netflix’s Marvel universe shrinks as Disney evolves into a competitor. Things aren’t exactly peaches and roses over at Disney’s end either. One would think that all this competition would be nothing but beneficial for consumers, right? Not if you have a varied preference in content consumption. As the conflict in interest between Netflix and Disney has demonstrated – including the recent cancellation of Jessica Jones and The Punisher — streaming is a zero-sum game now. As a result of the industry’s increasing obsession with streaming services, what was initially a healthy relationship between streaming services and Hollywood studios has mutated itself into a meticulously coordinated battle for content distribution rights where each party refuses to share. Instead of taking a step forward with the vast potential that streaming services innately possess, it seems like they are merely an extension of the narrowcasting niche marketing technique that was once prominent back in the 1990s, with cable. With The Mandalorian, the upcoming Star Wars spin-off series that will be exclusive to Disney +, set to premiere in late 2019, Disney is ready to give Netflix a run for its money. From Netflix to Amazon Prime, Hulu to HBO Now, Disney + to whatever Apple is naming their upcoming streaming service platform, it seems that the golden age of streaming has come to an end, ushering an era where consumers are tangled in a messy web of cherry picking what they want to consume. Whether it’s the exclusive Lord of the Rings prequel series over at Amazon Prime or the first ever live action Star Wars serial that will be premiering over at Disney +, if we’re not at the breaking point yet, we’re undoubtedly about to reach it.